In the winter, chunky and bulky yarns are my favorite to crochet with. I love the feel of the material as I crochet as well as how they wear or look when finished. Another thing I find indispensable in the winter are earwarmers. My ears always freeze, so if I am not already wearing a hat, I must have earwarmers with me at all times. 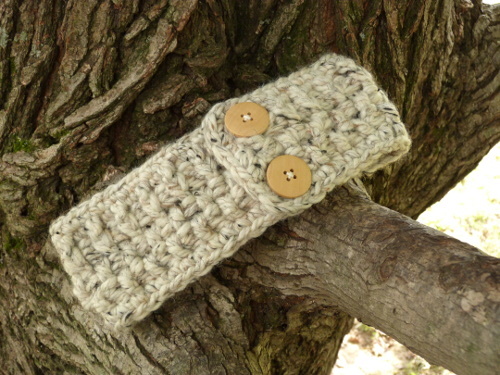 This pair of earwarmers is the perfect choice with it’s chunky yarn, basketweave stitch, and wooden buttons. Make the earwarmers in four rows of basketweave material and then single crochet around for a finished piece. Buttons add just the right touch, and you don’t have to worry about buttonholes because the fabric creates them naturally. Here’s to warm ears this coming winter! Gauge Swatch: 2’’w x 2’’h (5 cm x 5 cm) ch 7. Notes on size changes: for a smaller fit, crochet fewer chains to begin with and then continue pattern as instructed. Note: beginning ch 3 counts as 1 dc throughout pattern. Single crochet evenly around, working only 2 sc in each corner for a rounder look, finish off. With right side of ear warmers facing you, sew buttons along left end with sewing needle and thread. The chunky stitches themselves make natural buttons holes. Do you have some questions? I would love to help! Leave me a note in the comments below and I’ll see what I can do. This entry was posted on Wednesday, October 25th, 2017 at 10:02 AM by Amy	and is filed under Free Crochet Patterns. You can follow any responses to this entry through the RSS 2.0 feed. You can skip to the end and leave a response. Pinging is currently not allowed.